Hotel Sadova **** has 3 conference rooms of various sizes: Gdansk, Sopot and Gdynia. The Gdansk and Gdynia rooms can be combined to create one large conference room. All our conference rooms are located on the ground floor of the hotel. This makes our services accessible to disabled persons. All of the conference rooms are air-conditioned and have access to daylight. "Gdansk" conference room is our biggest room which size is 95 sqm. Maximum number of participants is 80 people in theatre style, 40 people in school style / U-shape and 50 people in banquet style. 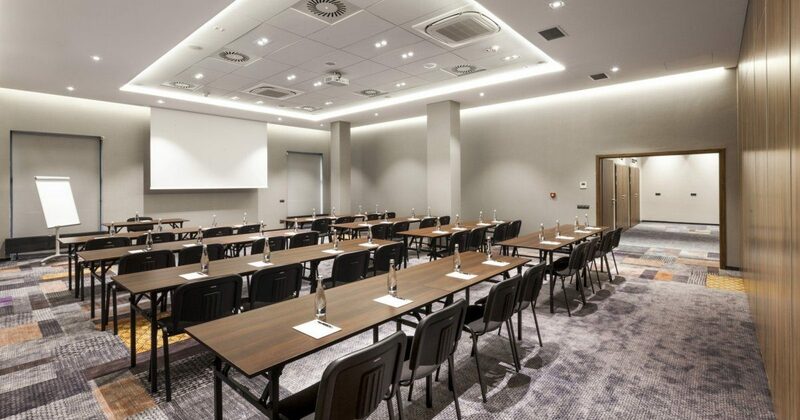 "Gdynia" room with size of 54 sqm is accurate for a bit bigger meetings because it is possible to set up 44 poople in theatre style, school / U-shape fo 22 people or banquet style for maximum 30 people. Thanks to mobile wall, we can connect "Gdańsk" and "Gdynia" and get the space of 149 sqm. It is perfect solution for big conferences and training, because maximum number of participants reaches up to 140 people in theatre style, 56 people in school style, 48 people in U-shape style and 90 people in banquet style. We also dispose mobile dancing floor that enables to organize event with party. "Sopot" room is our smallest conference room, ideal for chamber meetings as well as for small conferences and trainings. On 44 sqm is very comfortable to set up 34 poeple in theatre style or 16 people in school / U-shape style. We encourage you to request for a meeting room through the form below - we will contact you within 48 hours to set the details.